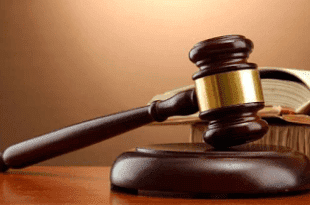 The Enugu East Magistrate Court on Wednesday remanded one Onyebuchi Nwatu, 22, in prison custody for allegedly stealing a pump action rifle with six rounds of live cartridges. The suspect, who is facing a two count bordering on stealing and burglary, also allegedly stole N400,000 belonging to one Linus Ugwu. The prosecuting counsel, Mr Chima Nwachwukwu, told the court that the defendant allegedly committed the offences on Dec. 21, 2017 at Ndiolo Village, Nchatancha, Emene in Enugu East Local Government Area. The prosecutor said that the rifle belonged to a vigilante group in the community. Nwachukwu said that the offences were contrary to section 495(a) of the criminal code, Cap 30 vol. ii laws of Enugu State and was punishable under the same act. The charges were read and the defendant pleaded not guilty. The Magistrate, Mrs C.R. Nwoye said that the court had no jurisdiction to try the defendant or grant him bail. Nwoye said the witnesses mentioned in the matter would pay a fine of N100,000 each if they failed to appear in court. The magistrate, however, transferred the case file to the Director of Public Prosecution for necessary documentation and adjourned till Feb. 9, 2018.